The vernacular names or common names of plants may, for a single species, be very numerous. While the official name of a species does not vary by language, it is always in Latin, or by location, it is universal, the vernacular name can change, not only by language, but also by location. Moreover, for the same species, at the same place, there can be several common names to designate it. To add to the confusion, a common name can designate more than one species. 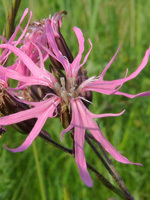 The photo above is Silene flos-cuculi (species name) but this plant also has the French vernacular names: Lychnide fleur-de-coucou, Oeillet des prés and Fleur de coucou, and for vernacular English names : Ragged robin, Meadow campion and Cuckooflower among others. With all these names, it is difficult, for a given language, to determine which is an "official". vernacular name. Thankfully for each country or territory there is usually a government agency, institution, or an accredited agency that determines the accepted vernacular name for a given species on its territory. If the French vernacular names follow the same grammatical rules as the Latin names, genus beginning with a capital letter, the specific epithet all lowercase, it is different for English vernacular names. Indeed, the French vernacular names are often the translation of the Latin names. In English this varies, moreover the English vernacular name can consist of three, four even a single word. Although sometimes the English vernacular name, like the one in French, is a translation of the Latin name, the problem in English is that the specific epithet precedes the genus name, such as for the species Anemone canadensis the French vernacular name Anemone canada , and the English vernacular name Canada anemone , are both translations of the Latin name, but in English it is reversed. So no grammatical rule sets for English vernacular names.